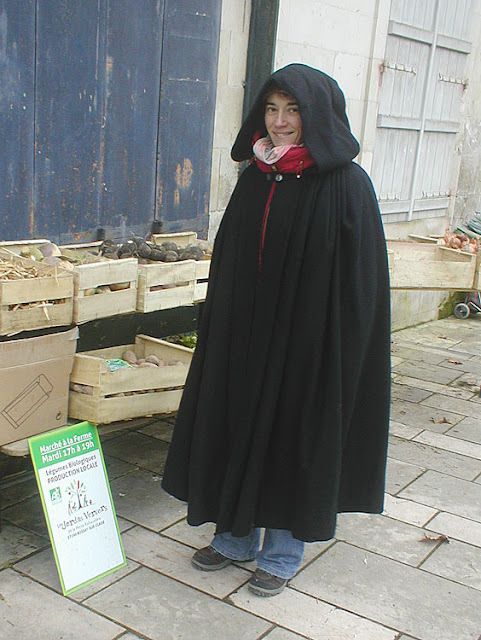 The market day in Preuilly between Christmas and New Year was very cold. This sort of weather is always unpleasant for the traders as not only do they have to spend the whole morning outdoors standing on cold pavement, but their customers might compound the misery by staying indoors in the warm and not spending at the market. 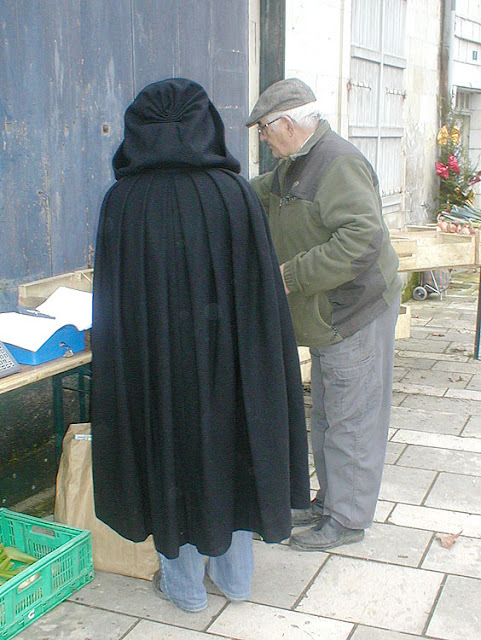 Dotty at the Jardins Vergers organic veg stall chose to combat the cold by wearing an antique cape. It was a superb garment, that I would guess dates from about 1900. It had belonged to the grandmother of a friend of Dotty's mother. Because Dotty is very small it fitted her perfectly. The cape is fully lined black wool, fastened by two cut steel buttons at the throat. It is pleated into the shoulders so that it sits and hangs perfectly. 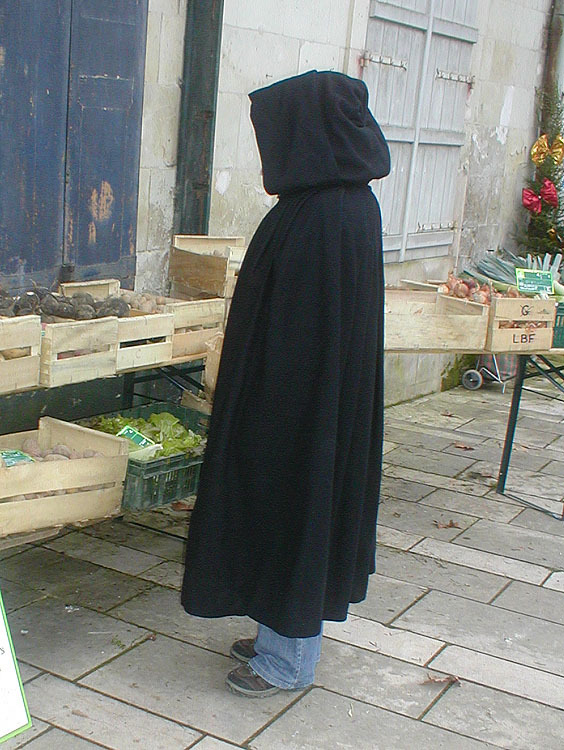 The hood is also pleated in such a way to make it stay in place rather than blowing off in the slightest breeze. Underneath it Dotty was wearing a down jacket, a scarf and three pairs of socks. She was also wearing knitted fingerless gloves with mitten pockets so she could adjust them for handling money. The whole concept is great.... and I have a apir of the same type of glove... well, two actually, I "lost" the first pair... but they are indispensable in cold, crisp weather... but like all clothing... except my Damart lonjons and vest, the cold, grey dampness passes through all!! It certainly did yesterday at any rate. I think Dotty didn't realise quite what a great garment it was until I pointed out some of its features. So beautifully designed and sewn. It elegantly takes care of a hood's tendency to fall forward and cover your eyes, especially when both your hands are full. The more I looked at it the better I realised it was. Me too. It's a beauty, isn't it? !